Don't get too attached to the guy you see shooting blasters and jumping from ship in Star Wars 1313's screenshots and videos. He's just a placeholder character plopped into place for the purposes of the game's unveiling. 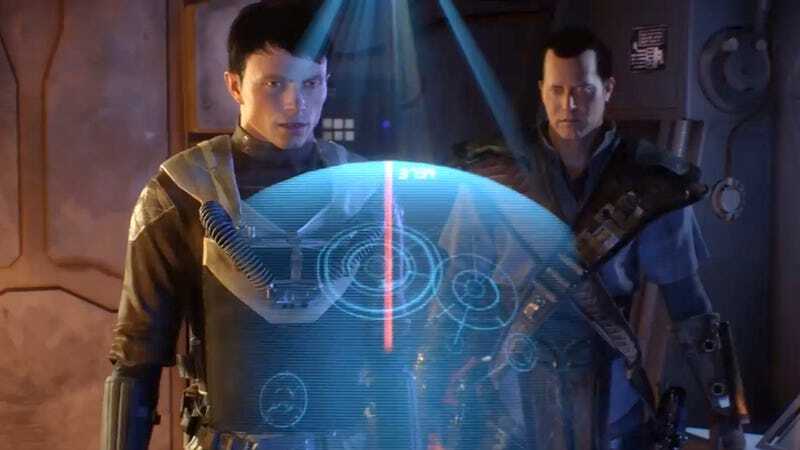 LucasArts isn't divulging very much about the story or characters in the just-revealed Star Wars 1313, but creative director Dominic Robillard was able to tell me why the developers didn't put players in the flowing robes of a Jedi again. "It's not that I think that that's overdone," says Robillard. "But the criminal underworld of 1313 is a little more grounded and that has to live in the mechanics of the game. Having mechanics that are limited by human ability makes things more relatable, then we can put all the cool stuff you can do into the gadgets and weapons." "You still get to do all of these amazing things because of the environment the game takes place in and because of the gear you have," he continues. "But at the core you still have these vulnerabilities that are a bit more relatable, so you won't have the demigod complex of a Jedi." If you fall in 1313, Robillard sums up, you know you're going to be in trouble. The demo I saw this morning centered on two very human bounty hunters descending into the subterranean bowels beneath Coruscant's surface, drawing from some of the same stuff shown in the game's worldwide debut. The pair were apparently on the hunt for the sentients they were assigned to capture. With one captured creature in tow, the pair board a transport only to have it attacked by a Hunter-Killer droid type leading a squad of assailants. The bounty hunters get knocked to the ground and get up behind cover firing blasters at the bad guys. At one point, the more grizzled of the two grapples a enemy in a half-nelson and call you over to punch him out. Then, as their own ship starts to burn and plummet, he stuffs a bad guy into an escape pod, throws in a grenade after him and fires the pod at the enemy ship. The resulting explosion cripples the bad guys' transport and leaves the hunters jumping from buring wreck to burning wreck until a the demo ends at a cliffhanger moment. Throughout the whole demo, the bounty hunters' banter recalled the rougish dialogue of Han Solo and the lighting, detail and destruction effects stood out like nothing else I've seen at E3 so far. The live PC demo was controlled by an Xbox 360 Logitech controller and Robilliard says that they're using a heavily modified Unreal 3 engine with lots of plug-ins and add-ons to make things pop the way they do. 1313 represents the first time that ILM, LucasFilm Animation, Skywalker Sound and LucasArts are all working full-time on a game project. The company knows they have to win back gamers' trust—I'll have more on that later this week—after the disappointing debacle of Star Wars: The Force Unleashed 2. For them, you could say that 1313 embodies a new hope.